Download "The Role of Government Policy in the Cost Competitiveness of Canadian Aviation: Impacts on Airports and Airlines"
1 The Role of Government Policy in the Cost Competitiveness of Canadian Aviation: Impacts on Airports and Airlines strategic transportation & tourism solutions Prepared for Aéroports de Montréal Air Transport Association of Canada Greater Toronto Airports Authority Vancouver Airport Authority Prepared by InterVISTAS Consulting Inc.
2 Government Policy and Cost Competitiveness of Canadian Aviation i Executive Summary The Context: Canada gateway competitiveness One of the four major priorities of the Canadian federal government is strong economic management. Several key initiatives are underway to lay the underpinnings for a strong economy, including a major focus on developing Canada s gateways and corridors. The role of gateways is critical, as Canada is an economic union of provinces and territories that must thrive in global markets and a world with an open trade regime. Two policies are of special importance for the development of gateways: Gateway Competitiveness. The Asia-Pacific Gateway and Corridor Initiative, announced in 2005, seeks to maximise trade and travel opportunities with emerging international markets. The Government expanding the initial Asia-Pacific focus to a national focus followed up with the 2006 National Policy Framework for Strategic Gateways and Trade Corridors. This framework is designed to advance the competitiveness of the Canadian economy on the rapidly changing playing field of global commerce. It will do so by providing focus and direction for strategies that foster further development and exploitation of the transportation systems that are key to Canada s most important opportunities and challenges in international trade. Canadian Air Competitiveness. To set the foundations to improve the opportunities and competitiveness of Canadian air carriers and the airport communities they serve, the Government announced the Blue Sky policy in Its purpose is to provide a framework for attracting new and expanded international air services. 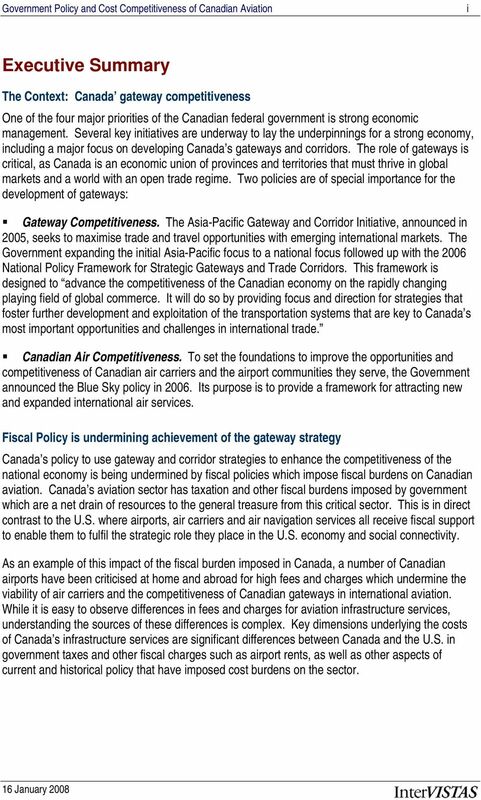 Fiscal Policy is undermining achievement of the gateway strategy Canada s policy to use gateway and corridor strategies to enhance the competitiveness of the national economy is being undermined by fiscal policies which impose fiscal burdens on Canadian aviation. Canada s aviation sector has taxation and other fiscal burdens imposed by government which are a net drain of resources to the general treasure from this critical sector. This is in direct contrast to the U.S. where airports, air carriers and air navigation services all receive fiscal support to enable them to fulfil the strategic role they place in the U.S. economy and social connectivity. As an example of this impact of the fiscal burden imposed in Canada, a number of Canadian airports have been criticised at home and abroad for high fees and charges which undermine the viability of air carriers and the competitiveness of Canadian gateways in international aviation. While it is easy to observe differences in fees and charges for aviation infrastructure services, understanding the sources of these differences is complex. Key dimensions underlying the costs of Canada s infrastructure services are significant differences between Canada and the U.S. in government taxes and other fiscal charges such as airport rents, as well as other aspects of current and historical policy that have imposed cost burdens on the sector. 4 Government Policy and the Cost Competitiveness of Canadian Aviation iii commercial rates, depending on the perceived level of risk for each individual airport. U.S. airports, on the other hand, are allowed to issue tax-free bonds. As bond holders do not have to pay taxes on the interest earned, U.S. airports can obtain access to debt capital at lower nominal rates than comparable commercial entities. GST. The fourth element is the Goods and Services Tax Canadian Airport Authorities pay the federal government on all purchases. This national sales tax has no equivalent in the U.S., thus U.S. airports do not incur this cost. Canadian airports and NAV CANADA receive input tax credits for operating and capital purchases, but ultimately airline users pay GST on all value added in the aviation chain, including infrastructure services. The U.S. has taxes on airline tickets and cargo waybills, but the funds from these are all channelled back into the aviation system. Fuel Tax. The fifth element is the federal and/or provincial fuel tax paid by air passengers. These taxes translate to an average effective cost of $3.08 per enplaned/deplaned passenger. Canadian aviation fuel tax Fuel taxes in the U.S. are revenues support the government s general revenue accounts. reinvested in aviation. These monies are not reinvested back into the aviation industry. 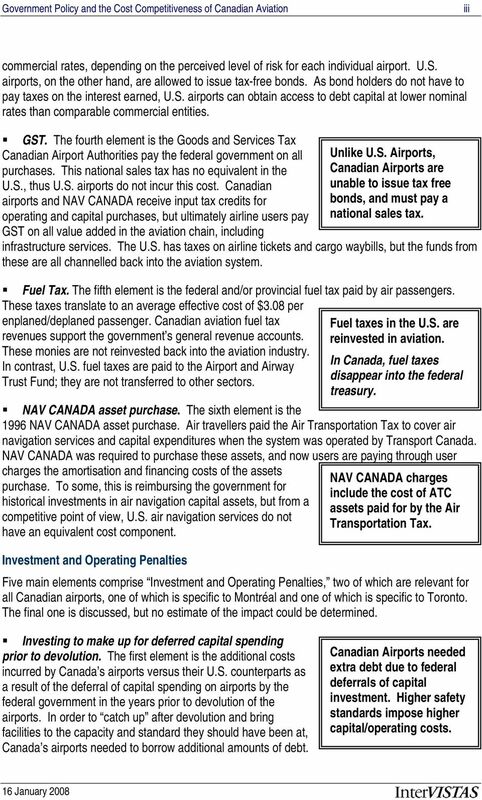 In contrast, U.S. fuel taxes are paid to the Airport and Airway In Canada, fuel taxes Trust Fund; they are not transferred to other sectors. disappear into the federal treasury. NAV CANADA asset purchase. The sixth element is the 1996 NAV CANADA asset purchase. Air travellers paid the Air Transportation Tax to cover air navigation services and capital expenditures when the system was operated by Transport Canada. NAV CANADA was required to purchase these assets, and now users are paying through user charges the amortisation and financing costs of the assets purchase. To some, this is reimbursing the government for historical investments in air navigation capital assets, but from a competitive point of view, U.S. air navigation services do not have an equivalent cost component. Unlike U.S. Airports, Canadian Airports are unable to issue tax free bonds, and must pay a national sales tax. 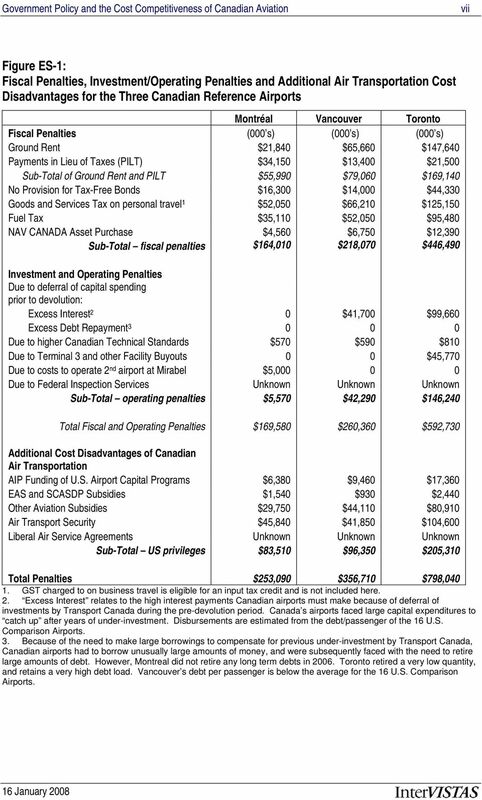 NAV CANADA charges include the cost of ATC assets paid for by the Air Transportation Tax. Investment and Operating Penalties Five main elements comprise Investment and Operating Penalties, two of which are relevant for all Canadian airports, one of which is specific to Montréal and one of which is specific to Toronto. The final one is discussed, but no estimate of the impact could be determined. Investing to make up for deferred capital spending prior to devolution. 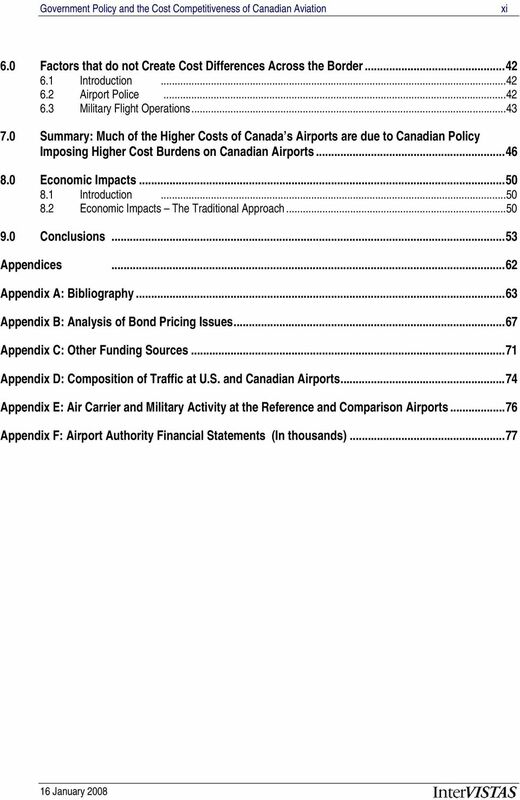 The first element is the additional costs incurred by Canada s airports versus their U.S. counterparts as a result of the deferral of capital spending on airports by the federal government in the years prior to devolution of the airports. In order to catch up after devolution and bring facilities to the capacity and standard they should have been at, Canada s airports needed to borrow additional amounts of debt. Canadian Airports needed extra debt due to federal deferrals of capital investment. Higher safety standards impose higher capital/operating costs. 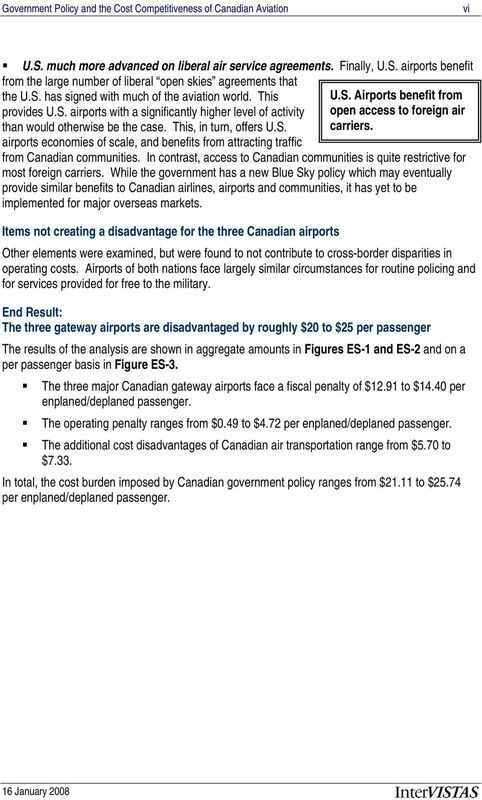 6 Government Policy and the Cost Competitiveness of Canadian Aviation v airports, this benefit averaged us$2.02 per enplaned/deplaned passenger (ca$2.24), a benefit that would be equivalent to an annual amount of ca$25.5 million for Montreal, $37.9 million for Vancouver and $69.5 million for U.S. Airports and airlines Toronto. Of the $2.24 benefit per passenger, $.56 represents benefit from government the subsidy from the U.S. general fund, and $1.68 of the capital funding, and subsidy benefit comes from the Airport and Airway Trust Fund to FAA air navigation and (AATF). Air travellers in the U.S. pay a ticket tax, cargo airline essential air service shippers pay a waybill tax and airlines pay a fuel tax that goes subsidies. into the AATF. If we confine the benefit only to the subsidy amount, the AIP benefit would be equivalent to an annual benefit of $6.4 million for Montreal, $9.5 million for Vancouver and $17.4 million for Toronto. Even though the bulk of the total $2.24 per passenger AIP benefit comes from passengers and cargo shippers via ticket, waybill and fuel taxes, the AATF funded portion still represents a significant benefit to U.S. airports, as it allows them to keep their airport fees and charges lower than Canadian airports. Essentially, U.S. airport charges are lower because part of their infrastructure costs is paid for from other sources, distorting comparisons of Canadian and U.S airport charges. 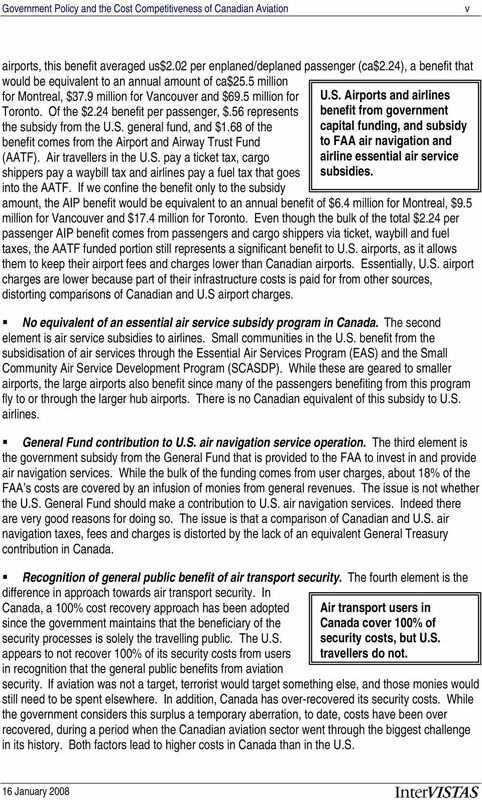 No equivalent of an essential air service subsidy program in Canada. The second element is air service subsidies to airlines. Small communities in the U.S. benefit from the subsidisation of air services through the Essential Air Services Program (EAS) and the Small Community Air Service Development Program (SCASDP). While these are geared to smaller airports, the large airports also benefit since many of the passengers benefiting from this program fly to or through the larger hub airports. There is no Canadian equivalent of this subsidy to U.S. airlines. General Fund contribution to U.S. air navigation service operation. The third element is the government subsidy from the General Fund that is provided to the FAA to invest in and provide air navigation services. While the bulk of the funding comes from user charges, about 18% of the FAA s costs are covered by an infusion of monies from general revenues. The issue is not whether the U.S. General Fund should make a contribution to U.S. air navigation services. Indeed there are very good reasons for doing so. The issue is that a comparison of Canadian and U.S. air navigation taxes, fees and charges is distorted by the lack of an equivalent General Treasury contribution in Canada. Recognition of general public benefit of air transport security. The fourth element is the difference in approach towards air transport security. In Canada, a 100% cost recovery approach has been adopted Air transport users in since the government maintains that the beneficiary of the Canada cover 100% of security processes is solely the travelling public. The U.S. security costs, but U.S. appears to not recover 100% of its security costs from users travellers do not. in recognition that the general public benefits from aviation security. If aviation was not a target, terrorist would target something else, and those monies would still need to be spent elsewhere. In addition, Canada has over-recovered its security costs. While the government considers this surplus a temporary aberration, to date, costs have been over recovered, during a period when the Canadian aviation sector went through the biggest challenge in its history. Both factors lead to higher costs in Canada than in the U.S.
7 Government Policy and the Cost Competitiveness of Canadian Aviation vi U.S. much more advanced on liberal air service agreements. Finally, U.S. airports benefit from the large number of liberal open skies agreements that the U.S. has signed with much of the aviation world. This U.S. Airports benefit from provides U.S. airports with a significantly higher level of activity open access to foreign air than would otherwise be the case. This, in turn, offers U.S. carriers. airports economies of scale, and benefits from attracting traffic from Canadian communities. In contrast, access to Canadian communities is quite restrictive for most foreign carriers. While the government has a new Blue Sky policy which may eventually provide similar benefits to Canadian airlines, airports and communities, it has yet to be implemented for major overseas markets. Items not creating a disadvantage for the three Canadian airports Other elements were examined, but were found to not contribute to cross-border disparities in operating costs. Airports of both nations face largely similar circumstances for routine policing and for services provided for free to the military. End Result: The three gateway airports are disadvantaged by roughly $20 to $25 per passenger The results of the analysis are shown in aggregate amounts in Figures ES-1 and ES-2 and on a per passenger basis in Figure ES-3. The three major Canadian gateway airports face a fiscal penalty of $12.91 to $14.40 per enplaned/deplaned passenger. The operating penalty ranges from $0.49 to $4.72 per enplaned/deplaned passenger. 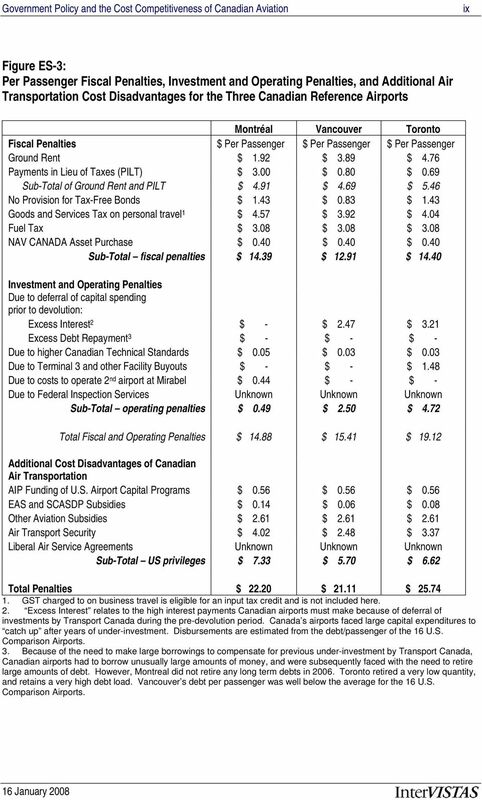 The additional cost disadvantages of Canadian air transportation range from $5.70 to $7.33. In total, the cost burden imposed by Canadian government policy ranges from $21.11 to $25.74 per enplaned/deplaned passenger. 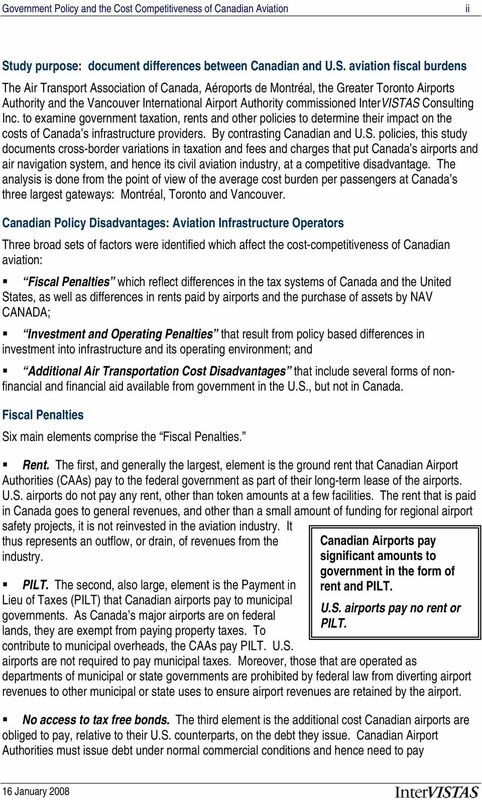 8 Government Policy and the Cost Competitiveness of Canadian Aviation vii Figure ES-1: Fiscal Penalties, Investment/Operating Penalties and Additional Air Transportation Cost Disadvantages for the Three Canadian Reference Airports Montréal Vancouver Toronto Fiscal Penalties (000 s) (000 s) (000 s) Ground Rent $21,840 $65,660 $147,640 Payments in Lieu of Taxes (PILT) $34,150 $13,400 $21,500 Sub-Total of Ground Rent and PILT $55,990 $79,060 $169,140 No Provision for Tax-Free Bonds $16,300 $14,000 $44,330 Goods and Services Tax on personal travel 1 $52,050 $66,210 $125,150 Fuel Tax $35,110 $52,050 $95,480 NAV CANADA Asset Purchase $4,560 $6,750 $12,390 Sub-Total fiscal penalties $164,010 $218,070 $446,490 Investment and Operating Penalties Due to deferral of capital spending prior to devolution: Excess Interest 2 0 $41,700 $99,660 Excess Debt Repayment Due to higher Canadian Technical Standards $570 $590 $810 Due to Terminal 3 and other Facility Buyouts 0 0 $45,770 Due to costs to operate 2 nd airport at Mirabel $5, Due to Federal Inspection Services Unknown Unknown Unknown Sub-Total operating penalties $5,570 $42,290 $146,240 Total Fiscal and Operating Penalties $169,580 $260,360 $592,730 Additional Cost Disadvantages of Canadian Air Transportation AIP Funding of U.S. Airport Capital Programs $6,380 $9,460 $17,360 EAS and SCASDP Subsidies $1,540 $930 $2,440 Other Aviation Subsidies $29,750 $44,110 $80,910 Air Transport Security $45,840 $41,850 $104,600 Liberal Air Service Agreements Unknown Unknown Unknown Sub-Total US privileges $83,510 $96,350 $205,310 Total Penalties $253,090 $356,710 $798, GST charged to on business travel is eligible for an input tax credit and is not included here. 2. Excess Interest relates to the high interest payments Canadian airports must make because of deferral of investments by Transport Canada during the pre-devolution period. Canada s airports faced large capital expenditures to catch up after years of under-investment. Disbursements are estimated from the debt/passenger of the 16 U.S. Comparison Airports. 3. Because of the need to make large borrowings to compensate for previous under-investment by Transport Canada, Canadian airports had to borrow unusually large amounts of money, and were subsequently faced with the need to retire large amounts of debt. However, Montreal did not retire any long term debts in Toronto retired a very low quantity, and retains a very high debt load. Vancouver s debt per passenger is below the average for the 16 U.S. Comparison Airports. 10 Government Policy and the Cost Competitiveness of Canadian Aviation ix Figure ES-3: Per Passenger Fiscal Penalties, Investment and Operating Penalties, and Additional Air Transportation Cost Disadvantages for the Three Canadian Reference Airports Montréal Vancouver Toronto Fiscal Penalties $ Per Passenger $ Per Passenger $ Per Passenger Ground Rent $ 1.92 $ 3.89 $ 4.76 Payments in Lieu of Taxes (PILT) $ 3.00 $ 0.80 $ 0.69 Sub-Total of Ground Rent and PILT $ 4.91 $ 4.69 $ 5.46 No Provision for Tax-Free Bonds $ 1.43 $ 0.83 $ 1.43 Goods and Services Tax on personal travel 1 $ 4.57 $ 3.92 $ 4.04 Fuel Tax $ 3.08 $ 3.08 $ 3.08 NAV CANADA Asset Purchase $ 0.40 $ 0.40 $ 0.40 Sub-Total fiscal penalties $ $ $ Investment and Operating Penalties Due to deferral of capital spending prior to devolution: Excess Interest 2 $ - $ 2.47 $ 3.21 Excess Debt Repayment 3 $ - $ - $ - Due to higher Canadian Technical Standards $ 0.05 $ 0.03 $ 0.03 Due to Terminal 3 and other Facility Buyouts $ - $ - $ 1.48 Due to costs to operate 2 nd airport at Mirabel $ 0.44 $ - $ - Due to Federal Inspection Services Unknown Unknown Unknown Sub-Total operating penalties $ 0.49 $ 2.50 $ 4.72 Total Fiscal and Operating Penalties $ $ $ Additional Cost Disadvantages of Canadian Air Transportation AIP Funding of U.S. Airport Capital Programs $ 0.56 $ 0.56 $ 0.56 EAS and SCASDP Subsidies $ 0.14 $ 0.06 $ 0.08 Other Aviation Subsidies $ 2.61 $ 2.61 $ 2.61 Air Transport Security $ 4.02 $ 2.48 $ 3.37 Liberal Air Service Agreements Unknown Unknown Unknown Sub-Total US privileges $ 7.33 $ 5.70 $ 6.62 Total Penalties $ $ $ GST charged to on business travel is eligible for an input tax credit and is not included here. 2. Excess Interest relates to the high interest payments Canadian airports must make because of deferral of investments by Transport Canada during the pre-devolution period. Canada s airports faced large capital expenditures to catch up after years of under-investment. Disbursements are estimated from the debt/passenger of the 16 U.S. Comparison Airports. 3. Because of the need to make large borrowings to compensate for previous under-investment by Transport Canada, Canadian airports had to borrow unusually large amounts of money, and were subsequently faced with the need to retire large amounts of debt. However, Montreal did not retire any long term debts in Toronto retired a very low quantity, and retains a very high debt load. Vancouver s debt per passenger was well below the average for the 16 U.S. Comparison Airports. 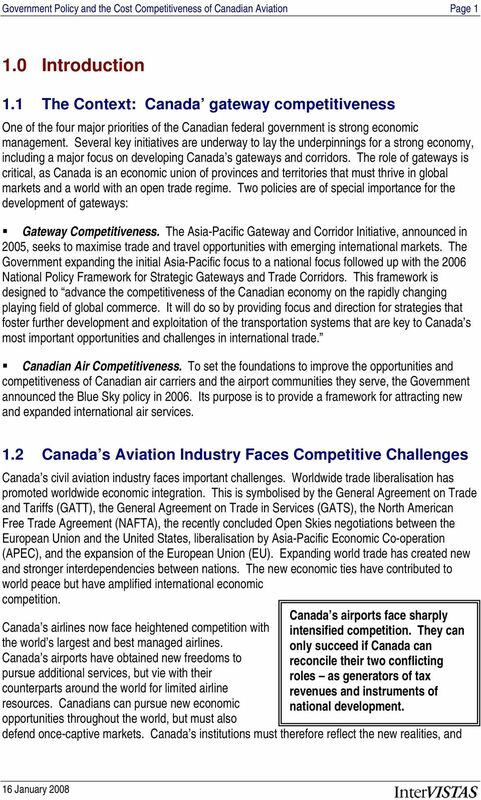 14 Government Policy and the Cost Competitiveness of Canadian Aviation Page 2 form part of a national competitive advantage. In such an environment, few industries are more internationalised, and more vital to Canada s international competitiveness, than aviation. In response to these competitive realities, the Canadian government has implemented two key policies dealing with air and gateway issues. The Blue Sky policy of 2006 is premised on the principle that air transport is a direct contributor to a dynamic economy. It provides a framework to encourage aviation competition and to develop international air services. The 2005 Asia-Pacific Gateway and Corridor Initiative was established to boost the competitive position of western Canadian gateways and to take advantage of emerging markets. In 2006, the Government extended the policy to a national focus with the National Policy Framework for Strategic Gateways and Trade Corridors designed to advance the competitiveness of the Canadian economy on the rapidly changing playing field of global commerce. It will do so by providing focus and direction for strategies that foster further development and exploitation of the transportation systems that are key to Canada s most important opportunities and challenges in international trade. 1 The policies examined here constitute an important component of enabling Canada s airports to serve as the strategic gateways that will serve the future growth and prosperity of the nation. 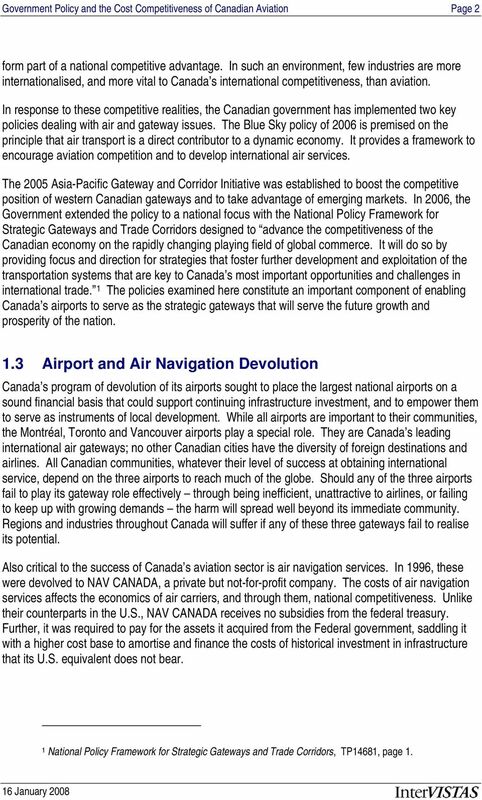 1.3 Airport and Air Navigation Devolution Canada s program of devolution of its airports sought to place the largest national airports on a sound financial basis that could support continuing infrastructure investment, and to empower them to serve as instruments of local development. While all airports are important to their communities, the Montréal, Toronto and Vancouver airports play a special role. They are Canada s leading international air gateways; no other Canadian cities have the diversity of foreign destinations and airlines. All Canadian communities, whatever their level of success at obtaining international service, depend on the three airports to reach much of the globe. Should any of the three airports fail to play its gateway role effectively through being inefficient, unattractive to airlines, or failing to keep up with growing demands the harm will spread well beyond its immediate community. Regions and industries throughout Canada will suffer if any of these three gateways fail to realise its potential. Also critical to the success of Canada s aviation sector is air navigation services. In 1996, these were devolved to NAV CANADA, a private but not-for-profit company. The costs of air navigation services affects the economics of air carriers, and through them, national competitiveness. Unlike their counterparts in the U.S., NAV CANADA receives no subsidies from the federal treasury. Further, it was required to pay for the assets it acquired from the Federal government, saddling it with a higher cost base to amortise and finance the costs of historical investment in infrastructure that its U.S. equivalent does not bear. 1 National Policy Framework for Strategic Gateways and Trade Corridors, TP14681, page 1. 15 Government Policy and the Cost Competitiveness of Canadian Aviation Page Canada s Airports Criticised As Being Expensive Canada s airports have achieved tremendous success in making long overdue investments in infrastructure and in providing high levels of customer service. However, this success is in contrast with their worldwide image, especially among airlines. They are often criticised as being very expensive. 2 Based on the cost to land a given aircraft, it may appear that Canadian airports are much less efficient that their United States counterparts. In a 2006 ranking of airport charges (see Figure 1-1), Toronto-Pearson and Vancouver placed first and fourth (among the limited number of airports surveyed) in terms of the airport charges (Montréal was not included in this survey). 3 With the exception of Newark airport and to a lesser extent John F. Kennedy airport, this index suggests that Canadian airports are very costly to serve. For some, this raises questions as to the efficiency and quality of management of Canada s airports. Such criticisms usually assume that airports worldwide face largely similar institutional settings and that any disparities in fees and charges are attributable to the quality of management. But this fails to recognise the unique fiscal and policy environment in which Canada s airports operate. The same holds for aspects of NAV CANADA s operation. While managers of Canada s airports and air traffic control system can and must be held accountable for managing their facilities in an effective and efficient manner, there are limitations to effective and efficient management that exist due to the fiscal and policy environment. It is important to outline these limitations so Canadians understand the various origins of problems and can respond in an effective and appropriate manner. 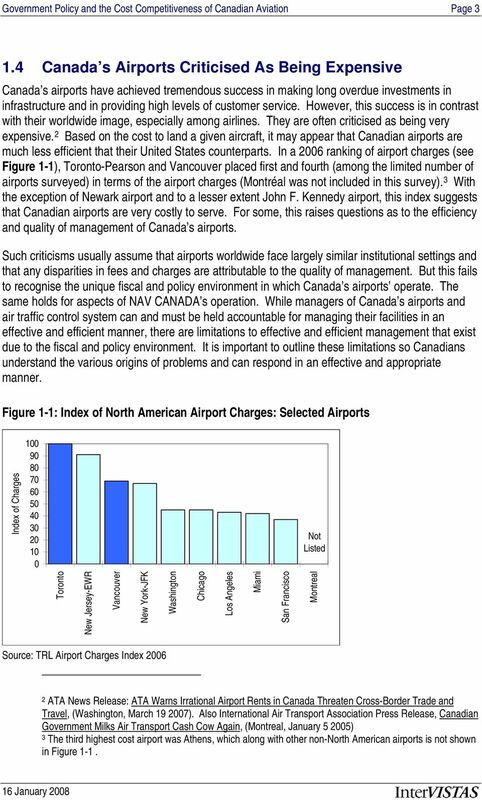 Figure 1-1: Index of North American Airport Charges: Selected Airports Index of Charges Not Listed Toronto New Jersey-EWR Vancouver New York-JFK Washington Chicago Los Angeles Miami San Francisco Montreal Source: TRL Airport Charges Index ATA News Release: ATA Warns Irrational Airport Rents in Canada Threaten Cross-Border Trade and Travel, (Washington, March ). Also International Air Transport Association Press Release, Canadian Government Milks Air Transport Cash Cow Again, (Montreal, January ) 3 The third highest cost airport was Athens, which along with other non-north American airports is not shown in Figure 1-1. 16 Government Policy and the Cost Competitiveness of Canadian Aviation Page Purpose of This Study The Air Transport Association of Canada (ATAC), in cooperation with Aéroports de Montréal (ADM), the Greater Toronto Airports Authority (GTAA), and the Vancouver Airport Authority (VIAA), tasked InterVISTAS Consulting Inc. to examine the cost impacts of Canada s taxation, rent and other policies, relative to the government imposed or policy related costs faced by their U.S. competitors. 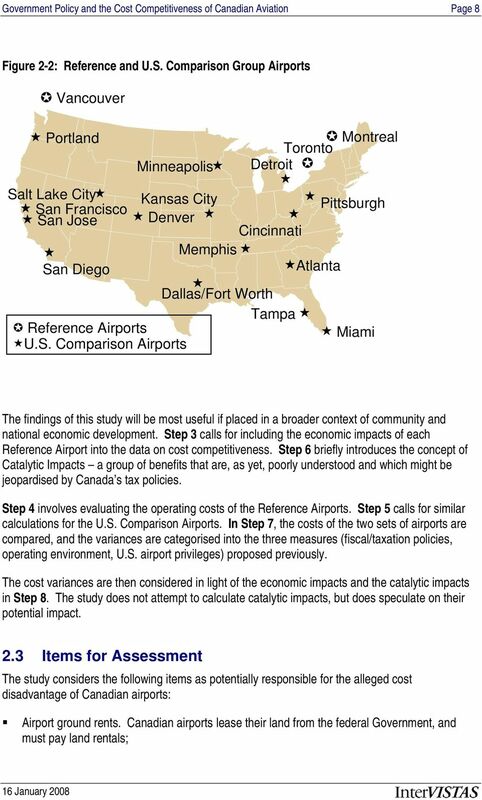 Specifically, the InterVISTAS research would: Assess the impact of government taxation policies on the capital and operating costs of the three major Canadian airports, relative to their peers in the U.S.; Identify any other operating or historical factors that might affect the operating or capital costs of Canadian airports, and lead to cost disparities with the U.S. peer airports; Identify any other operating or historical factors that might affect the operating or capital costs of NAV CANADA, and lead to cost disparities with its U.S. FAA peer; Identify and measure the magnitude of federal, state/provincial, and municipal tax regimes affecting U.S. and Canadian airlines and measure their contribution to operating cost differentials; Integrate the findings on airlines and airports, and prepare a series of benchmarks to represent the total cost burden on civil aviation in Canada and in the United States; Identify any factors that, through their direct or indirect relationship with Canada s civil aviation industry, might either dilute or amplify the consequences of Canada s policies on civil aviation. 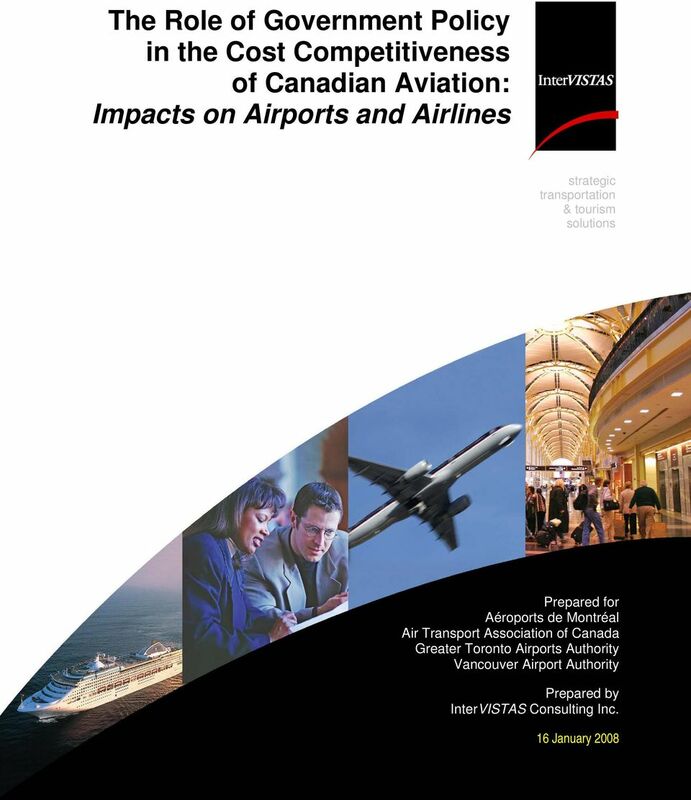 This study examines the cost competitiveness of the Montréal, Toronto, and Vancouver airports and compares their cost performance to a set of 16 airports in the United States. 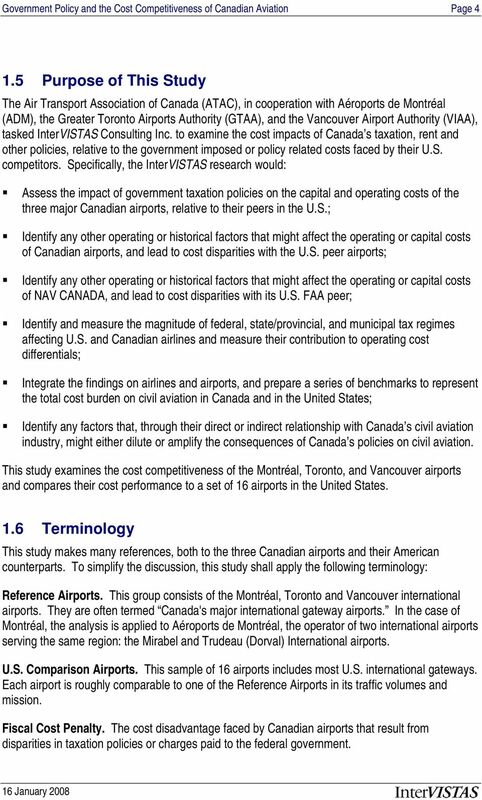 1.6 Terminology This study makes many references, both to the three Canadian airports and their American counterparts. To simplify the discussion, this study shall apply the following terminology: Reference Airports. This group consists of the Montréal, Toronto and Vancouver international airports. They are often termed Canada's major international gateway airports. 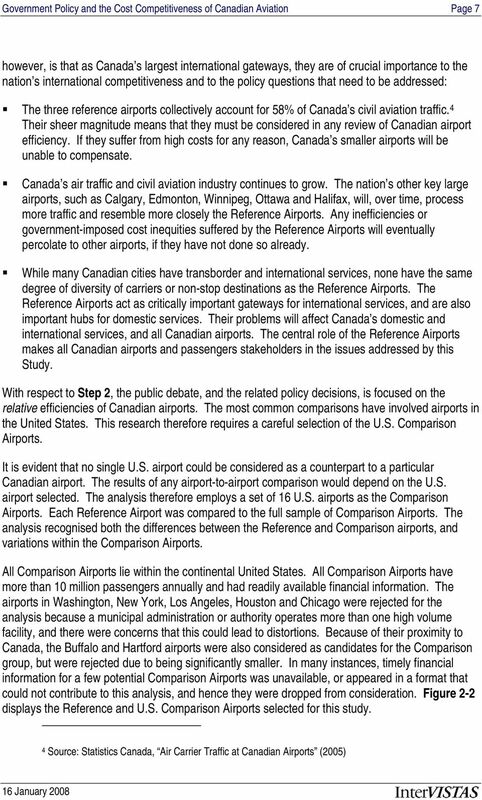 In the case of Montréal, the analysis is applied to Aéroports de Montréal, the operator of two international airports serving the same region: the Mirabel and Trudeau (Dorval) International airports. U.S. Comparison Airports. This sample of 16 airports includes most U.S. international gateways. Each airport is roughly comparable to one of the Reference Airports in its traffic volumes and mission. Fiscal Cost Penalty. The cost disadvantage faced by Canadian airports that result from disparities in taxation policies or charges paid to the federal government. 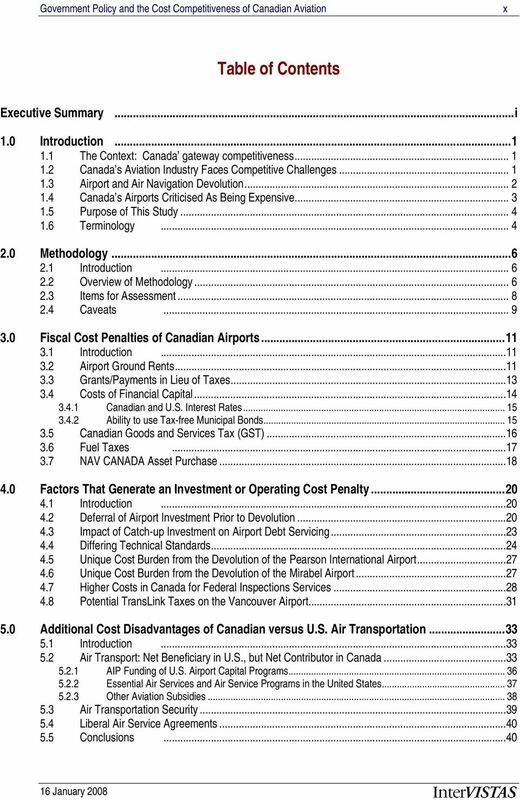 17 Government Policy and the Cost Competitiveness of Canadian Aviation Page 5 Investment and Operational Cost Penalty. The cost disadvantage faced by Canadian airports that result from differences in the operating environment, including higher safety standards in Canada, and the need to make catch-up capital expenditures because of underinvestment during the years prior to devolution, as well as other situations where non-typical capital expenditures were required. 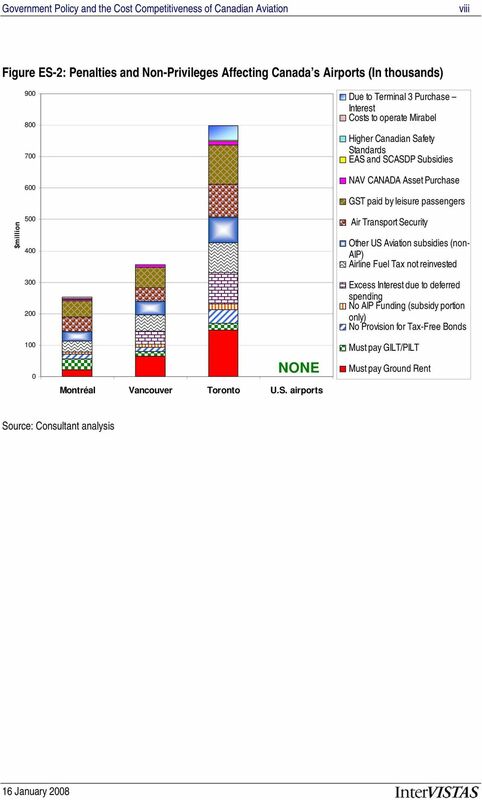 Additional Cost Disadvantages of Canadian Air Transportation. 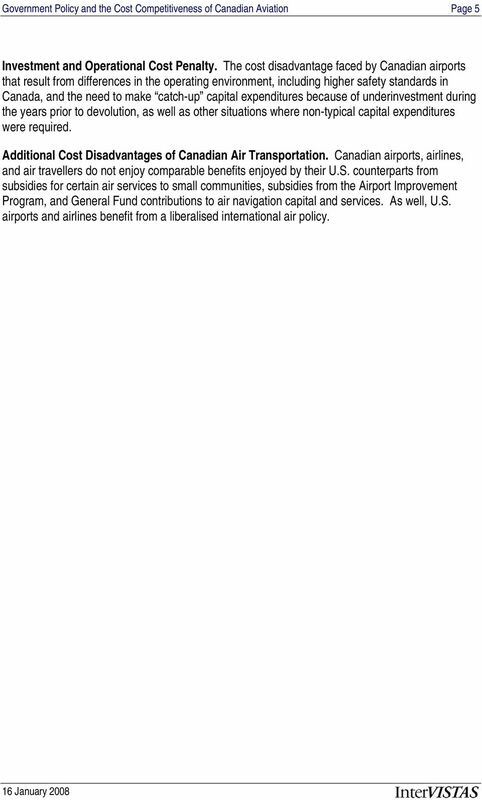 Canadian airports, airlines, and air travellers do not enjoy comparable benefits enjoyed by their U.S. counterparts from subsidies for certain air services to small communities, subsidies from the Airport Improvement Program, and General Fund contributions to air navigation capital and services. As well, U.S. airports and airlines benefit from a liberalised international air policy. 21 Government Policy and the Cost Competitiveness of Canadian Aviation Page 9 Grants/payments in lieu of taxes; Differing costs of raising capital, reflecting the availability of tax free municipal bonds in the United States; Taxes charged by TransLink in Vancouver on parking spaces; Differences arising from the timing of investments and the Canadian government s policies on development of publicly owned and operated airport facilities; Differing government policies and practices concerning investments in airport facilities; Differences in traffic mix; Differences in climate; Differences in Canadian and U.S. policies for financing airport development; Differences in federal sales taxes, the Goods and Services Tax and fuel charges; Cost differences arising from different safety standards; Taxes and charges related to federal inspections services; Taxes and charges related to air travel security; Subsidies for air navigation services; Capital costs for air navigation services; and Policing of airport facilities. 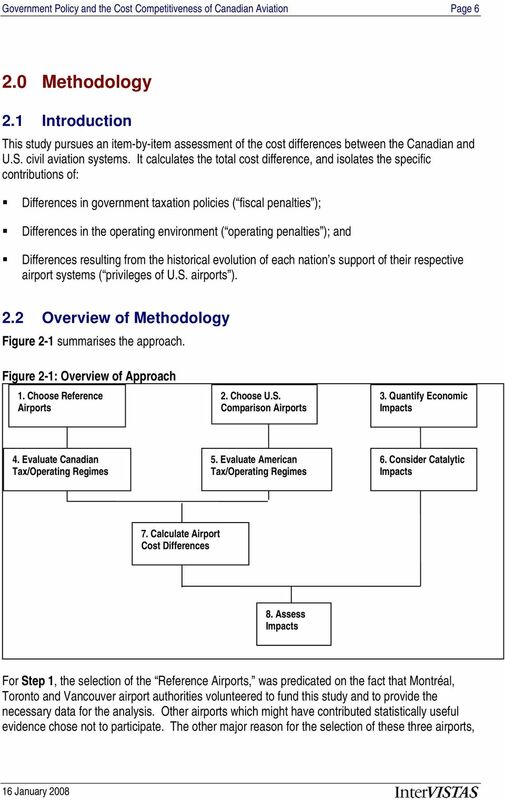 2.4 Caveats The methodology compares the three Reference Airports to 16 U.S. Comparison Airports. The Comparison Airports are all facilities of national importance. Most handle traffic volumes that are comparable to those of the Reference Airports, although some (e.g. Atlanta) are far larger. In many instances, the airports financial statements were not readily available or their results were aggregated with non-airport activities. The choice of Comparison Airports thus depended heavily on the financial data available. It meant that Miami and Tampa would belong to the Comparison group, but that Cleveland, Philadelphia and Seattle would be absent. In many instances, the financial statements needed considerable interpretation. The statements of changes in working capital sometimes did not distinguish between interest on long term and short term debt, or between interest payments and payments of the principal. Income statements also varied in the level of detail on operating costs. 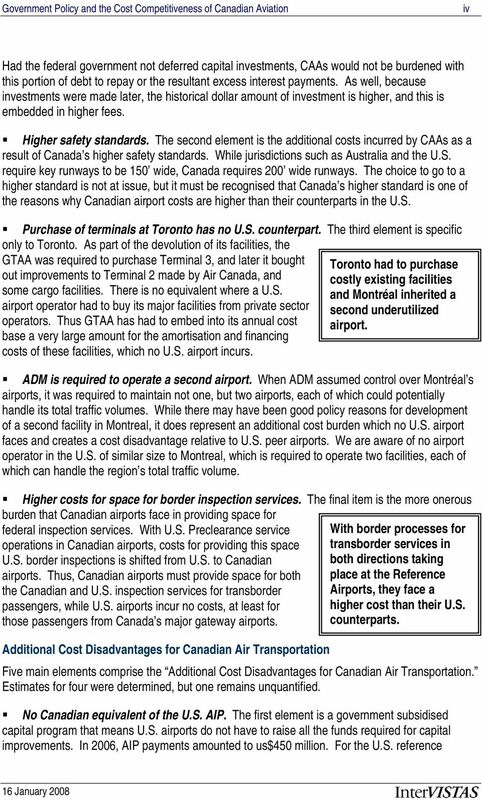 22 Government Policy and the Cost Competitiveness of Canadian Aviation Page 10 These anomalies lend further justification to the use of several Comparison Airports. A smaller selection or a 1-to-1 comparison between the Reference and Comparison Airports would have made the results of this study unduly sensitive to the choice of a single comparator airport. Toronto s Pearson Airport poses several major challenges. The sheer magnitude of the airport, its traffic, and its capital program make the results of this study especially sensitive to the conditions at Pearson. The GTAA s capital program encountered large increases in the price of construction materials. It also had to purchase Terminal 3 from private developers. No other North American airport had a comparable disbursement to buy a terminal from a private sector developer. Moreover, the GTAA had to pay Air Canada for improvements to Terminal 2, and also purchase existing cargo facilities in order to undertake its development program. The Canadian airports landing fee covers many services that are not normally provided by U.S. airports, or are covered by separate fees. These services include common use terminal equipment, gate usage and counter space. While their landing fees may therefore seem very high, and could attract a lot of unwanted attention, they may generate Since the range of services covered by landing fees varies dramatically, a strict comparison of landing fees is an apples-to-oranges exercise that gives a distorted picture. more than offsetting changes in ground costs incurred by airlines. By shifting certain cost elements from the airlines to the airport, and allowing the airport to generate the cost savings of a facilitywide program, they may decrease total expenses borne by the carriers. Critics of Canada s airports may overlook the wider range of services covered by the landing fees. The next chapter includes an item-by-item summary of results. It examines how the various items impact the cost competitiveness of the Reference Airports. YOUR TAX DOLLAR. Here s a quick overview of where that money went and how it was raised. Management Discussion and Analysis of Financial Position and Operating Results The purpose of this analysis is to provide the reader with an overview of how the financial position of Héroux-Devtek Inc. Privatization of Airports The Canadian model Pierre Gagnon Vice-president, Legal Affairs and Secretary, Aéroports de Montréal. Accounting for Infrastructure Projects within Enterprise Zones (EZ) and Tax Increment Financing (TIF) Funded Programmes. Competitive Alternatives Special Report: Focus on Tax 2012 Edition competitivealternatives.com Corporate Sponsors ii Competitive Alternatives 2012 Contents 1. Summary 1 2. Measuring Total Tax Costs 6 3.